As November draws to a close we were in full Santa prep mode with two teams tackling the decorating. Firstly the decorations were taken to Duffield by DMU early this morning which was the first DMU to venture out of Wirksworth for a month. It doubled as a test run for 51505 which is returning to service for this Santa season. The team at Wirksworth finished decorating the train and also decorated the outdoor Christmas tree which looks great. Down the yard, further exam work continued on 50170 ready for when that is called upon later in the month. A test customer went out on the track this afternoon before it went dark. A dark, damp and windy day saw a small team assemble at Wirksworth to decorate the Santa train. This was mostly achieved and looks good. The outdoor tree was put up but wasn't decorated due to the weather. The big news of the day was EVRA's SK going on short term loan to the Foxfield Railway to help with the Santa trains in December. The fitment of the steam heat recently not only proved useful for us but will hopefully suit their needs too! I would imagine that the PW team got suitably wet down the line today too in their sleeper changing quest. The penultimate Shottle Steam Special service today continued to see a steady growth in visitor number with a large group of walkers turning up to join the first service. The Wirksworth booking hall was kept busy with Santa bookings throughout the day. 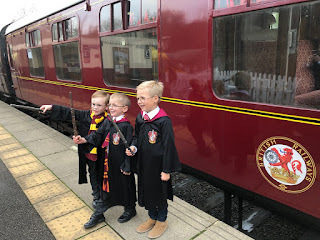 The 15.00 train was turned into 'Hogwarts' as a large birthday party with a wizards theme enjoyed a trip along the valley. At Wirksworth station work continued on the new station building and in the training room Neil F-L continued to update volunteer records. 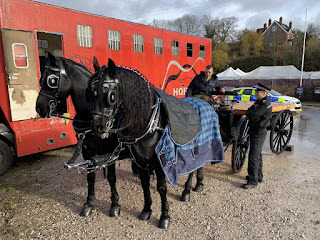 John Rhead was also in attendance assessing Guard's continuing competence and Ron could also be found working on the miniature railway extension. Today's service was supported by the EVRA shop and Station Cafe. A cold and miserable day today where further work to ready the Santa train took place. A team also put up another light on the station to illuminate the proposed exit route for Santa. They then proceeded to put one up on the Maintenance Facility as well. 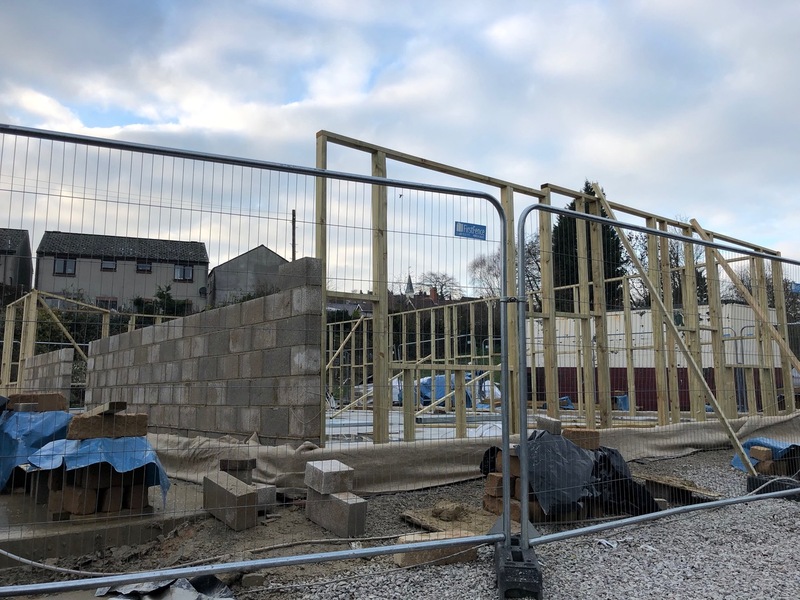 The team looking after the construction of the new Station Building were in full flow with the rest of the wooden frames going and a contractor making a good start on the brickwork. Helen Hills our Catering Manager put on a marvellous spread for our volunteers as we enjoyed our annual volunteer's buffet in the station cafe. It great to welcome Anne Walker back at the railway and she took the opportunity to see first hand our 08 shunter 'G. R. Walker' on display at platform one. Wyvernrail plc's MD Mike Evans was in attendance and thanked all the volunteers on behalf of the Board of Directors for their hard work and dedication. In relation to restoration work Tim will brief you later on progress with the Duke and Ron continued to lay ballast in preparation for the extension of the miniature railway. Today's service was supported by the EVRA shop, Station Cafe and Booking Hall staff. In a day where the Santa bookings were flowing well, the Maintenance Team were changing a failed buffer on the Class 101 centre car so that it is fit for service when the day arrives and the Santa season begins. Further work continued on the Derby Lightweight DMU and also EVRA's TSO to make it watertight. The PW gang are now making full use of the Shottle to Duffield blockade by spot resleepering with concretes in difficult areas which require more time than other areas. Quite a big story of the day is the first part of the new station building at Wirksworth began to rise from the ground today as the first frames for the walls were fitted. There is still a fair way to go but it was nice to see. I didn't manage to get a photo after they had vacated because of bad light but maybe tomorrow. The railway fell silent for two minutes at 11:00 to remember our veterans, with the scheduled departure held until 11:05. 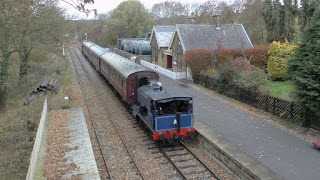 It was quite a busy train for the time of year with plenty of people enjoying the Shottle Specials operated by steam loco Henry Ellison and Class 08 G.R. Walker. 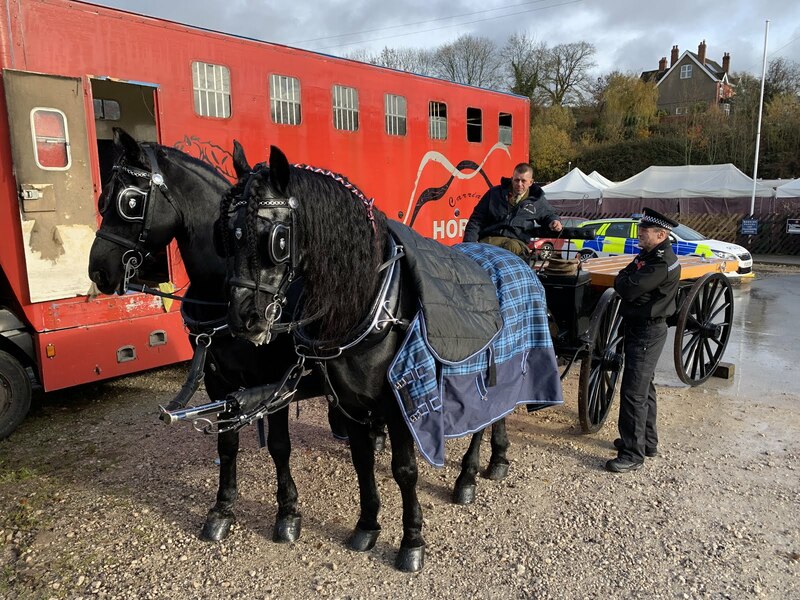 We hosted the gun carriage when it wasn't involved in the Remembrance Day parade in the town. Down in the shed welding repairs continued on the back end of Class 108 53599 with new crash pillars being introduced. Another team installed a couple of new LED floodlights in the car park near the Mess Room and Conference Room which will certainly help during the Christmas period. Quite an interesting day for a winter Thursday with two charters operating alongside each other meaning the line was in two-train mode. 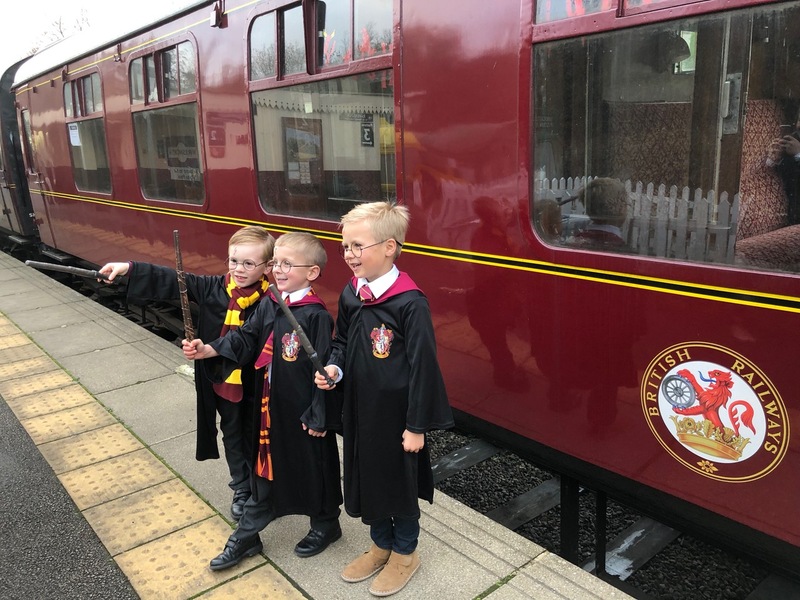 One was for a rail college who enjoyed a ride on the DMU and the other for a local school who had Swordfish and coaching stock. Both trains passed each other twice in the day as both groups did two returns. Down the yard, work continued on the body work of Faraday and also the corridor end repairs of the Class 108. Construction of the new station building continued too. A busier day then yesterday on our Shottle Specials despite it being a damp drizzly day. The top and tail Henry Ellison/Class 14 combination worked well. 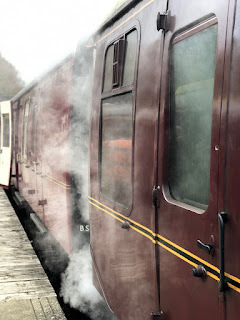 There is something quite atmospheric about steam heat, especially in the damp weather. It was fairly quiet down the yard although a day was had on the restoration of Faraday, with bodywork still the aim of the game. A first for our railway today with a mixed traction hauled service. 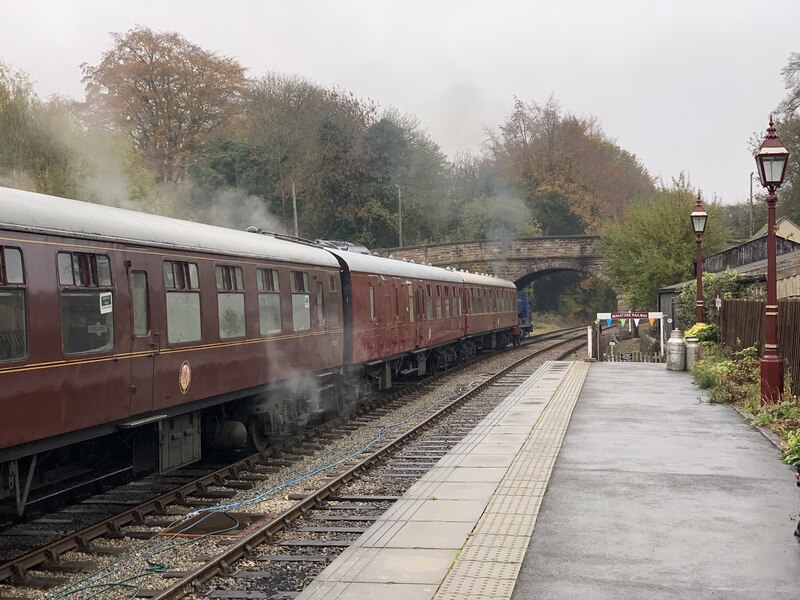 Due to planned, essential track maintenance taking place on the line between Duffield and Shottle today we embarked on our November steam hauled service to Shottle. Today's train consisted of three steam heated mark one coaches with 'Henry Ellison' and D9537 Class 14 'Eric' toping and tailing. This configuration proved a wonderful photo opportunity for our visitors today. It was also pleasing to see 08 'G.R. Walker' in operation too shunting the stock onto platform two so Henry Ellison could couple up early to provide warm coaches for our visitors. Steam and Diesel in perfect harmony! Down the yard the DMU team continued their work on 53599 and the 8F group held their annual meeting in the town. Today's service was supported by the Wirksworth booking hall staff, EVRA shop, Miniature Railway and Station Cafe. A good start to November.